As president of Compton College—which just last year was formally recognized as a California Community College, becoming the college system’s 114th campus—I feel I have a different perspective than most alumni on staying connected to UC Santa Cruz. Above: Keith Curry, Ed.D., at a commencement ceremony for Compton College. Photo courtesy of Keith Curry.In my role as college president, I participate in fundraising telephone calls, lunch and dinner meetings with potential donors, and exploring many new opportunities to raise funds for Compton College. As a UC Santa Cruz alumnus, when I receive those yearly calls from the fundraising office, I have to remind the callers (who are often very well-mannered and excited) that I already have the Keith Curry Destination Higher Education Scholarship, and all my financial donations go directly to that scholarship program. This scholarship is awarded annually to a UC Santa Cruz graduate who has dedicated significant personal time and energy to the African/black community on campus. It is given out at the end of each academic year and is meant to help the graduate pursue future leadership opportunities. Since 2009, scholarship funds have been awarded to 11 graduates, providing a total of $5,500 in scholarships. But also, ever since I graduated from UC Santa Cruz, I have returned to the campus to speak with students. After graduating, many of them reached out to me for career guidance and requested to meet. During these meetings, I learned many of them were applying to graduate school or pursuing other leadership opportunities, and together we sought out and researched available financial resources to help them pursue that dream. While meeting with these young alumni, I found myself reminiscing and asking questions about UC Santa Cruz, faculty and staff members, and student organizations. These conversations made me think about my own college experiences, such as my accomplishments, Oakes College, and my friends. I was often reconnecting with UC Santa Cruz during these meetings while also providing advice to young people just starting out and beginning to build their careers—a very fulfilling experience. 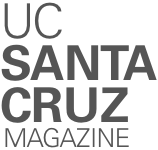 This year is the “Year of Alumni” at UC Santa Cruz, and I would like to encourage you to become connected or reconnected with your alma mater. Staying engaged is not always about money (though of course UC Santa Cruz will gladly accept a donation). Rather, it is about giving back to UC Santa Cruz students (remember when you were one?) and maintaining a connection with the academic programs, with fellow alumni, and, most importantly, with UC Santa Cruz, which has given us all so much. Keith Curry, Ed.D., is the president/CEO of Compton College.